Nelkin Designs Blog: Leyfi for Me! 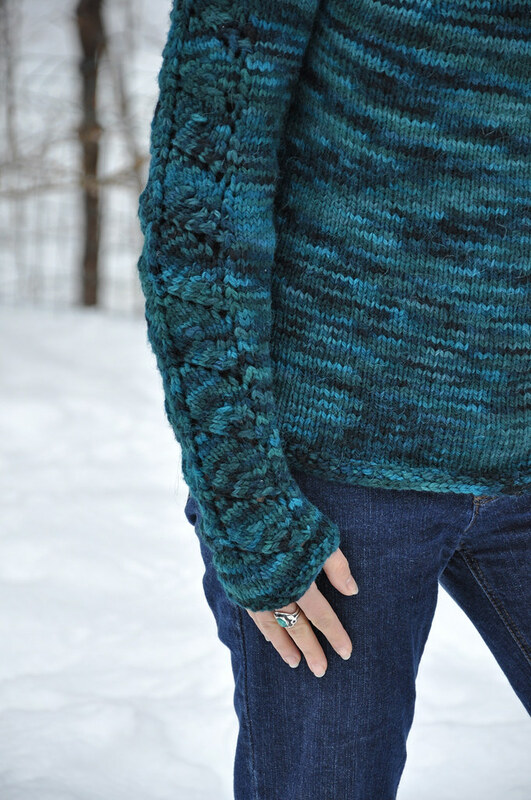 It seems that every so often I MUST take a break and knit something for me from a pattern I did not design... when Interweave Knits came this Fall, I knew that Leyfi was just for me! 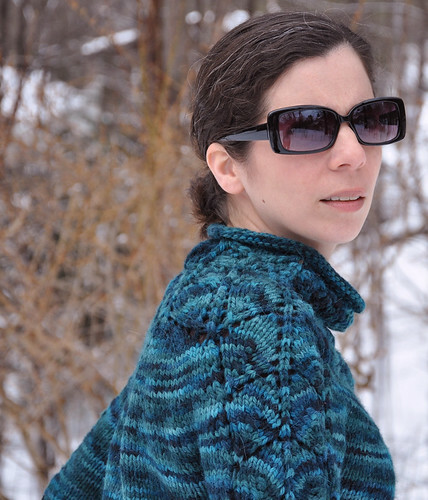 A quick knit in bulky yarn that would result in a warm stylish sweater. Schaefer discontinued one of my favorite yarns, Esperanza, this fall and I had stashed a few skeins in my favorite color Spruce that I knew would be perfect. 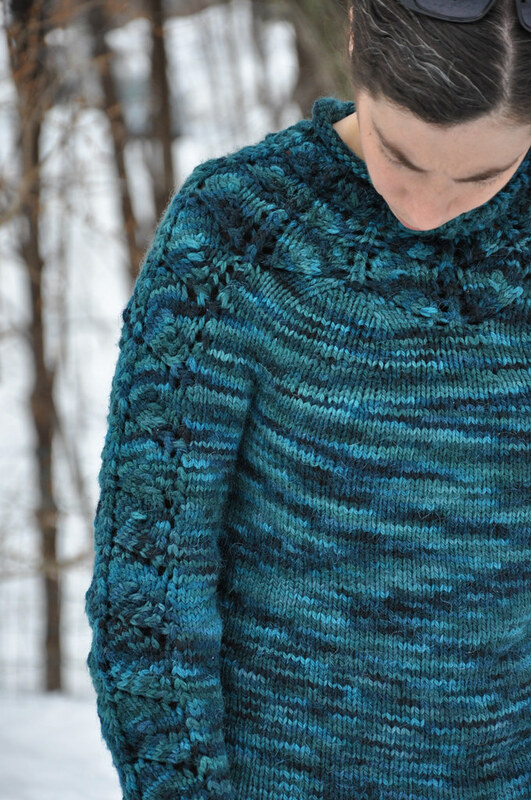 I have always admired Romi's lacework and really enjoyed seeing how she incorporated it into the Icelandic shape yoke of this top down sweater! I did end up making a few mods to the pattern, but that's just because I can't help myself, and I REALLY wanted it to fit me PERFECTLY! The yoke was too long for my adolescent shoulder area (read "not-buff"), so I shortened the rnds worked so that was 12.75 inches long at the split. Added back waist shaping (a la owls) so that it comes in at the waist and flatters my figure a wee bit more. Shaped Sleeves: Began decreases after the 4th sleeve chart repeat so that the sleeves tapered down to the wrist. I worked these on every rnd 1 and 6 for repeats 5 - 8 as follows: K1, ssk, work to last 3 sts, k2tog, k1, ended with 31 sts for size 36". I did like the roll at the neckline, but did not want to have the sleeve or bottom hems roll adding bulk where I didn't need it. 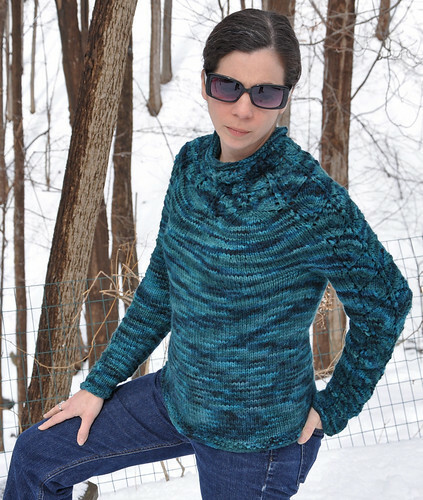 I worked two rnds of seed stitch at the hem of the sleeve, and 3 rnds at the bottom hem of the sweater. 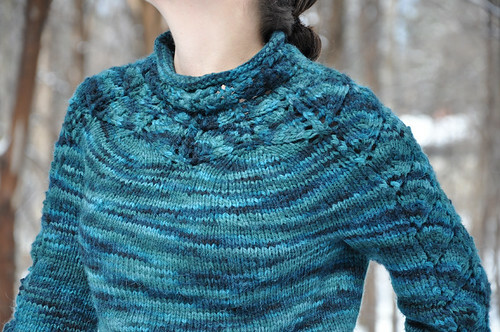 I also listed all the mods on my Ravelry project page so they will be there too, if you need them!